Coding managers must work diligently to reenergize ICD-10 efforts … and then hope the new codes actually get implemented. Like many HIM professionals, Sarah Lucas was shocked when she heard that ICD-10 would be delayed yet again. The ICD-10 program director at University of Washington (UW) Medicine, who has been leading the implementation for the nine-entity health system since 2011, says the organization was ready to tackle ICD-10 head on. "My initial response was disbelief," she says. "Then we immediately began sending out communications to let people know what had happened and what they could expect over the next days and weeks." The delay, first announced this past April, was difficult for many coding managers, HIM directors, and others to comprehend. UW Medicine, an early adopter of ICD-10, had just finished training its physicians and coders when the delay was announced. Physicians were documenting the specific details necessary for ICD-10 while coders were dual coding daily. The health system also had finalized its budget cycles for the upcoming year. All of the pieces seemed to be in place when news of the delay broke. "For us, the challenge was to maintain a long-term strategy so both our coders and physicians could continue to practice while also maintaining the expectations for clinical and operational productivity, revenue cycle throughput, and continuing other initiatives," Lucas says. "We couldn't afford to throw away all that work to train coders and clinicians. We had to ask, 'How do we maintain what we have already completed, expand areas that we would not have been able to address on the previous timelines, pause what we can, and be ready to pick back up quickly when the time comes?'" Experts agree that even the most prepared hospitals face challenges due to the ICD-10 delay. Will coders continue to dual code? Can the organization afford to continue to hire outsourced staff members indefinitely? How and when will coders undergo refresher training? 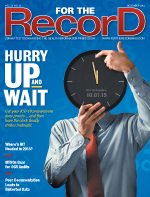 How will the organization convince physicians and others that ICD-10 is for real this time? These are just a few of the questions that managers must now address. One of the biggest challenges that coding managers face is that not every organization had garnered the momentum necessary to keep the initiative going in the short term following the delay announcement, says Fletcher Lance, national health care leader at consulting firm North Highland. "When the delay was announced, many at the executive level really made the decision to slow things or stop," he says, adding that ICD-10 resources were simply allocated to other initiatives. The challenge for these facilities will be to revive their ICD-10 efforts and reengage physicians and the C-suite, Lance says. Lindsay Davis, branch manager of HIM at Addison Group, has also worked with organizations that have completely ceased their ICD-10 efforts due to the delay. "We've seen budgets get completely cut following the delay announcement," she says. "That budget was reallocated with the intent of reinstating it later as the deadline approached. Other networks kept programs running, business as usual—it's really a case-by-case scenario, depending on the budget." Facilities that started and then stopped their efforts may have a particularly difficult time moving forward, Lance says. "It's hard to create that inertia," he notes. "How do you reenergize and assess where you were in terms of your inventory of activities?" Lance says it's up to the Centers for Medicare & Medicaid Services (CMS) to spark renewed efforts. "CMS really has to convince the marketplace that it's going to go live this time," he says. "There's still a little bit of doubt and uncertainty and maybe even some hope by some providers that it will get pushed back or even go away." Organizations that had already obtained physician buy-in prior to the delay may have an easier time regaining momentum; however, there's no guarantee. Physicians and others are skeptical, and many argue that they have every right to be leery. Fortunately for UW Medicine, physician engagement hasn't been a significant problem because Lucas, physician leaders, and the rest of her team worked hard to embrace dissenting opinions and communicate openly with providers. Some physicians didn't want to continue to document to the specificity of ICD-10 after the delay was announced, but Lucas worked with physician champions to get everyone on board as much as possible. The extra time also has allowed coders to dive into each physician's documentation and provide specific feedback. "We received pushback like any other organization," Lucas says. "But if we specifically say, 'We reviewed 10 of your medical records. Here's what you're documenting well and here's where you have opportunities to improve,' we have found that this really breaks down barriers. Physicians generally like feedback on their own performance if it's thoughtful and appropriate. It has also given us an opportunity to work with our coders on how to more effectively communicate with our physicians." Physician champions—both inside and outside of the organization—and personalized education play a critical role in reviving ICD-10 efforts, Lance says. For example, the CMS launched several specialty-specific resources for physicians to help them prepare. Its website, www.roadto10.org, includes webcasts, templates, and personalized stories from physicians about what ICD-10 means to them. Another challenge related to the ICD-10 delay is that employees will likely come and go before the actual go-live. Turnover is difficult to manage at anytime, but it's even more imposing in the midst of a transition such as ICD-10 when coder knowledge is so valuable. The longer the ICD-10 implementation is stretched out, the more likely it is that personnel changes will occur, says Tyler Wallace, CEO and founder of the consulting firm Small Jumps. While urban hospitals may have an easier time filling vacancies, those in rural areas probably will struggle to fill positions, says Wallace, who provided the project management infrastructure for an 18-month nationwide rural hospital ICD-10 collaboration that included 50 critical access hospitals. "One of the largest issues we had in supporting 50 hospitals was the frequent turnover in the ICD-10 project team," he says. Team members typically include an executive sponsor (eg, a CEO or CFO), a project team leader (usually the HIM director), and core staff members (eg, coders, IT staff, finance staff). "In these local ICD-10 project teams, we saw two or three people leave each month for an extended period of time," Wallace says. "The issues ranged from a death in the family to maternity leave to staff cuts to quitting or promotions." Davis says turnover is a tremendous challenge for several reasons. "There is high demand for coders and a shortage of talented ones now that remote coding hospitals are competing nationally for talent and not just with the facility down the road," she says. "Vendors are also offering a lot of money to lure talent to their clients." Problems also loom when larger hospitals acquire smaller rural counterparts during the transition. "It puts the rural HIM manager in a bind because they're not only losing their coders to outside the organization or due to retirement, but they're losing them because the corporate entity needs a coder," Wallace says. • Clearly define roles and responsibilities for the ICD-10 project. • Create a mechanism to track each team member's progress. • Ensure solid documentation so that incoming team members can review information quickly and get up to speed easily. And don't forget to develop teamwork, Davis notes. "Building a collaborative, team-oriented work environment is critical," she says. "With so much turnover, it's important that everyone is on the same page so that in the event that someone leaves, organizations can be confident that any projects stay the course and essential information does not leave with the departing employee." All employees appreciate open and honest communication, Lucas says. "Early on, we started to discuss what causes coders to leave. They don't just leave for more money. They leave because there are other issues going on and for more money," she says. "We really worked with our coding and CDI [clinical documentation improvement] teams to understand their concerns and communicate openly about how we were going to address those concerns. We trained them early and then gave them regular opportunities to practice. We didn't wait until the end. We really engaged them to make sure they were happy with their environment and that they were engaged with the organization." To overcome attrition challenges, health care organizations must ramp up their retention strategies, Davis says. "Coders want to work somewhere that will provide the ICD-10 training that will give coders the opportunity to further enhance their careers," she says. "Bonuses also encourage coders to stick with their organizations." At UW Medicine, several coders did retire when the initial October 1, 2013, ICD-10 deadline was announced. At that point, Lucas says the organization collaborated with a local agency to create an extensive coder training program to allow new graduates to gain on-the-job experience. In the three-month program, participants code real patient encounters in both ICD-9 and ICD-10 to be audited. After completing the program successfully, the graduates are moved to the central office on a trainee basis for their first year. This win-win arrangement provides training for new coders and creates a pipeline to quickly fill vacancies. Lucas says working with new graduates has alleviated the need to rely heavily on outsourced coding companies. Also, rookie coders often possess a strong knowledge of anatomy, physiology, and pharmacology. The program at UW Medicine may be part of a trend. "This past year, we've really seen an influx of interest in organizations wanting to collaborate with educational institutions," says Brooke Palkie, an assistant professor of HIM at the College of St. Scholastica in Duluth, Minnesota. Like many schools, the College of St. Scholastica had followed AHIMA's guidance and moved to an ICD-10–only curriculum for the 2013 academic year. During this time, students did not receive any training in ICD-9. When the ICD-10 delay was announced in April, the Commission on Certification for Health Informatics and Information Management made the decision to convert the RHIA and RHIT certification exams back to ICD-9. "We immediately tried to push out resources for the students who had ICD-10–only education," Palkie says. "It was provided on a limited basis by AHIMA, and it was our role to get it out to the students." Although the delay has been devastating for health care organizations that have already spent significant time and resources to prepare, Palkie says it has been equally as devastating for the schools and universities trying to prepare knowledgeable professionals. Currently, College of St. Scholastica students are dual trained in ICD-9 and ICD-10. They receive formal training in ICD-9 and complete online, self-paced training in ICD-10. "Dual training is an enormous task, and it's really a lot to ask of the students to learn two systems," she says. The biggest challenge for new graduates regardless of whether they were trained in ICD-9, ICD-10, or both continues to be their lack of actual experience working in a health care setting. "We have to work more toward a partnership—the business side and the educational side—if we want to keep producing successful and competent individuals who are going to be working in the health care field," Palkie says. One of the biggest unknowns is whether organizations will be able to continue to dual code throughout 2015. At UW Medicine, coders—as well as compliance auditors who don't normally code on an ongoing basis—have continued to dual code professional and facility services for one hour daily. As coders dual code, they're able to provide immediate feedback to physicians using an electronic documentation tool, an important consideration in cases where a lack of documentation results in an acuity shift. Lucas says dual coding doesn't have a large effect on productivity because coders perform it prospectively as they're coding in ICD-9. "As coders are moving through their work queues, they have to read that chart to code it in ICD-9. While dual coding, we ask them to start with the ICD-10 codes and then code the ICD-9 codes at the same time," she says. "As we train physicians to document to the specificity required for ICD-10, we're seeing improved ICD-9 specificity at the same time. We are also able to audit for areas where coders or clinicians need more education and then rapidly respond with materials to address risk areas." However, not all organizations are able to allow coders to dual code. "I think a lot of folks were finding that dual coding was just too much," Lance says. "It was too hard to run two coding shops at once. I think there will be some experimentation around how that works during this period." Wallace says organizations must plan for uncertainty, which may include yet another ICD-10 delay. "If you start dual coding now, who knows if it will get delayed again? If we're just playing the odds, it's going to get delayed again. That's what history has shown us in the past," he says. Wallace recommends ceasing the dual coding effort until March or April, particularly in rural hospitals. "There aren't a lot of resources at rural hospitals. You might have one, two, or three coders at a rural hospital. Here in Georgia, 50% of the rural hospitals operate in the red. They cannot afford a 20% productivity cut for their coders by dual coding indefinitely," he says. Regardless of where an organization stands in terms of ICD-10 readiness, experts say it's important to make the most of the extra time to prepare. To combat any challenges occurring due to the delay, experts say coding managers should determine answers to several pertinent questions. If your organization ceased or slowed its ICD-10 efforts after the delay was announced, what is the communication strategy around restarting the implementation? How will you remind individuals why ICD-10 is clinically relevant, why it's good for business, and how it will potentially improve outcomes? How will you maintain that communication throughout 2015 (eg, training)? How will the organization revise its timeline to reflect an October 1, 2015, deadline? For example, organizations that had trained physicians now must encourage them to continue to document to ICD-10's specificity. How will you ensure that this occurs? If an organization had yet to begin physician training, it should plan to focus on documentation and coding audits between now and the spring, Wallace says. Develop tailored education plans for each physician based on those audit results, and then roll out education programs in April, he adds. How will the organization sequence resources to match its revised timeline? Many coders were completely ready for a 2014 go-live, which meant that organizations must now budget for ongoing refresher training, Wallace says. As a result, they also may need to budget for outsource coding assistance for a longer duration. These costs will continue to mount the longer that ICD-10 is drawn out, he adds. What is your testing strategy with payers? Given the added time to prepare, try to test with as many payers as possible. How can the organization enhance its vendor relationships? If you're working with two or three coding vendors, Davis recommends doubling it up to make sure you're getting the coverage you need. "Productivity will drop a significant amount once the switch to ICD-10 occurs, around 50% with a steady increase up to 70%. Health care providers need to staff up to ensure the productivity decrease doesn't negatively impact the business," she says. How will the organization ensure that coders and physicians are content? Don't get so wrapped up in the technical details that you forget to check in with physicians and coders, says Lucas, adding that it's important for managers to ensure a positive and supportive work environment.